The Specter of a Meltdown? The Spectre flaw enables one compromised program, such as a web browser, to compromise another program running on the same machine, such as Microsoft Word. If a hacker can penetrate your browser via the Internet, he can leapfrog from there across every program running on the system. The Meltdown flaw allows hackers to gain access to a portion of a computer's memory that should be off-limits to all software except the operating system. And Meltdown doesn't care if you run Windows, Linux, or Mac OS X. Any of those systems may be vulnerable. As Meltdown’s name suggests, truly bad things can happen when a rogue program gains access to that portions of memory that should only be accessible by the operating system.. You may have seen the dreaded Blue Screen Of Death (BSOD) where Windows displays the cryptic “fatal memory fault at address…” Boom! Crash! Worse, Meltdown enables an attacker to access all memory, including areas where your personal information is stored while you are working with it. There lies the profit motive that drives the most widespread attacks. The mercenary “adults” can use Meltdown to make millions. The titans of tech including chipmakers, Microsoft, Apple, and the Linux community, have scrambled to issue hardware and software patches for Spectre and Meltdown. All hands on deck, as they say! But there is still lingering uncertainty about whether the patches work, or if they do more harm than good. Ah, fun with words. The software flaw known as "Spectre" is a homophone for "specter." The former refers to a ghost, phantom, or apparition, and the latter is defined as "a source of terror or dread." Both can be scary, but only one of them is likely to attack your computer. As of January 23, Wired! magazine reported that firmware patches issued hastily by Intel, AMD, and ARM to close Meltdown vulnerabilities in their chips “can inadvertently cause serious problems beyond processing slowdowns, including random restarts, and even the blue screen of death.” https://goo.gl/Hczrq1 Microsoft went so far as to release a patch that disabled the Intel patch. Since then, there has been thunderous silence from the tech press corps. Does that mean the coast is clear? Is it safe to install firmware updates to your CPU and BIOS, as Intel, AMD, and ARM urge you to do? And how is that done, exactly? Best of all, its user interface includes two big buttons allowing you to Enable or Disable protection for Meltdown and/or Spectre. If either is greyed out, your system lacks that type of protection. Gibson goes into detail on why you might want to disable either of the protection options, to avoid the performance penalty they may impose. But unless you are noticing a marked decline in speed, I would not recommend doing so. The only annoying things about InSpectre are the goofy sound effects, and the display of the results. Looking at InSpectre report is a bit clunky, because the window cannot be resized, and the small font can be hard to read. Position your pointer anywhere within InSpectre’s text window, press Ctrl-A to “select all,” then Ctrl-C to copy the selection, and then Ctrl-V to paste the report into a word processor or text editor. Then you can make the text as big as you like, save the report, or print it. The best protection against Spectre on the operating system side, as opposed to firmware and BIOS, is Microsoft Windows 10, Fall Creator’s Update, version 1709. Automatic updates are on by default in Windows 10, so you should have v 1709 unless you have deliberately delayed its installation. If you have, go to Windows Update Settings and allow v 1709 to be installed. Windows 7 users should have auto-updates enabled, too. Run Windows Update and let it install all critical and important updates to protect your system as much as possible via Windows. It is shocking to learn that nearly everything digital, from desktop PCs to phones and tablets to Internet of Things things, contains a chip that is vulnerable to Spectre or Meltdown. But bear in mind that the world is still not on fire; these vulnerabilities can and are being fixed, if they are not already fixed in your device(s). For now my best advice is “Keep calm and carry on,” auto-updating all of your software. 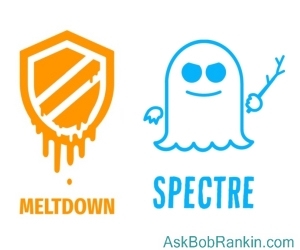 Most recent comments on "Spectre and Meltdown - Should You Worry?" Good summary, Bob. I have a laptop and a desktop PC, both manufactured by Dell. It doesn't appear that Dell is going to update the BIOS for either model due to their ages. The laptop is about 6 years old and the desktop is 5. Both are running Windows 10 (1709) with no issues. The only option other than replacement is to keep the system up to date and keep security software updated. Usually, I am not a freaked-out conspiracy theorist. Unfortunately, I cannot help but wonder if these "flaws" were just human error or if they were really back doors or traps, at the highest levels. I'm confused. In your article you say that Windows 10 version 1709 is good protection against Spectre. I downloaded InSpectre and ran it as an administrator. I get the message that my system is not protected against either Meltdown or Spectre. However, even after I've run InSpectre as an administrator, the buttons to enable Spectre and Meltdown protection are grayed out. Essentially, if your system is not protected, then the protection can't be turned off. It says my system is NOT protected and the buttons that are grayed out say TURN ON PROTECTION which is what I would do, but I can't. EDITOR'S NOTE: Exactly, if your system does not have the patch (protection) for either of the flaws, then the buttons to enable/disable will not be functional. You need to run Windows Update to get the patches. I decided to check for that update, and my computer says it was installed on 2/1. Then it says it tried 3 times to load it again on 2/2. Now in December I had a problem with a download that tried 7 times and said it was for AMD. I have Intel processers. That update made me have to completely go back to the beginning on my computer. I actually had to call an expert in to reload everything. Then it happened again last month, but on a smaller scale. I hope it's not happening again. My operating system is Windows 10 Pro. Just to remark that in order to exploit Spectre and Meltdown, the computer first must be seriously infected by a virus. As most computers are (hopefully) not infected, they have nothing to be afraid of. And if a computer is infected to that degree, Spectre and Meltdown are not the worst problem, since exploiting them is not that easy. There are much easier exploits for a virus to do. I can't escape the feeling that this is a big storm in a small teacup. I run multiple LinuxOS's on an Intel NUC and have not seen anything about Spectre and Meltdown. I ran InSpectre using Wine, but it just said I was unprotected. I'm in agreement with Harry above. One thing to keep in mind is that have been zero exploits found in the wild from either meltdown or spectre. I'm sure the bad guys are trying to create some virus but exploiting these vulnerabilities is really hard. (Intel originally found these in 1992, but decided it wasn't worth fixing as there were much easier ways to mess up a CPU.) That was then this is now. Second thing is you have to have malware running on your machine. No malware, no threat to you. Although this is not a problem for end users, it a *big* problem for business and industry that have to count on separation between users. With these vulnerabilities one user on a big web server could exploit all the other users, and possibly the system itself. Bottom line: end users on a single PC, Mac or Android - don't sweat it. Accept and install updates as they are provided. Big companies and industries - sweat it! I allowed the auto-install of the Fall Creators Update on Win10, and afterward, my PC was unstable and I had never been so concerned for its health, or when it would become unusable. After about 2 weeks of tolerating that, I did a system restore. It is still not back to normal but much more stable and tolerable. spectre is a big ploy by Microsoft to sell Windows 10. I have noticed that the prices have went up and even refurb computers running Window 10 are more expensive. Tried to install Win. 10 when it was free, but in crashed my machine more than one time. Just asking don't trust Microsoft. Mr. Rankin, I plead for your confirmation, as the way I understand the problem. Since the flaw is within the Intel CPU core; the patch that is being provided by the OperatingSystem is strictly a band-aid fix (w/efficacy still in question...) My motherboard maker has already issued a BIOS upgrade to 'flash' my i7-6700K CPU code for this flaw. (I have also been notified by my Modem/Router and NAS boxes need a similar flash). Thanks for your excellent article Bob. I wasn't aware of InSpectre so ran it and it looks like I'm protected against Meltdown by Windows 10 and need a BIOS update for Spectre. "I don't think about it I run PCMATIC"
bb; Do you think Equifax's IT department will "sweat it"? These concerned me for a day or two. But since Dell or HP probably won't get Intel to work with them to repair older processors, what's the point? And the new Android phone I bought isn't a Google device so expecting a correction from the manufacturer is like hoping to win the lottery when one isn't playing. And flashing my computers bios? NO WAY. Several times I purchased and installed updated bios chips and once a motherboard after trying to flash bios. Another satisfied PC Matic user here in Southeast Wisconsin!